White flesh instead of orange. Suitable for cooking. White Pepo aka Cotton Candy was introduced to commerce by the Rupp Seed Company of Wauseon, Ohio. It's a nice cream colored pepo type pumpkin (C. pepo) with some intentional variability in size, ideal for farmstand Halloween sales where this novel color introduction displays well beside traditional orange pumpkins. It has tender easily bruised skin (imperfections show up more on the white surface) with white flesh and a large seed cavity suited for carving. It's handle is not firm and long lasting though. The skin can darken exposed to the sun from cream to a creamy yellow color. Although not considered a prime edible squash, the flesh is crisp and can be shredded to make a fresh salad like cabbage slaw. It is generally considered tasteless and like a spaghetti squash (which it might resemble to some), takes on the flavor of the seasoning. 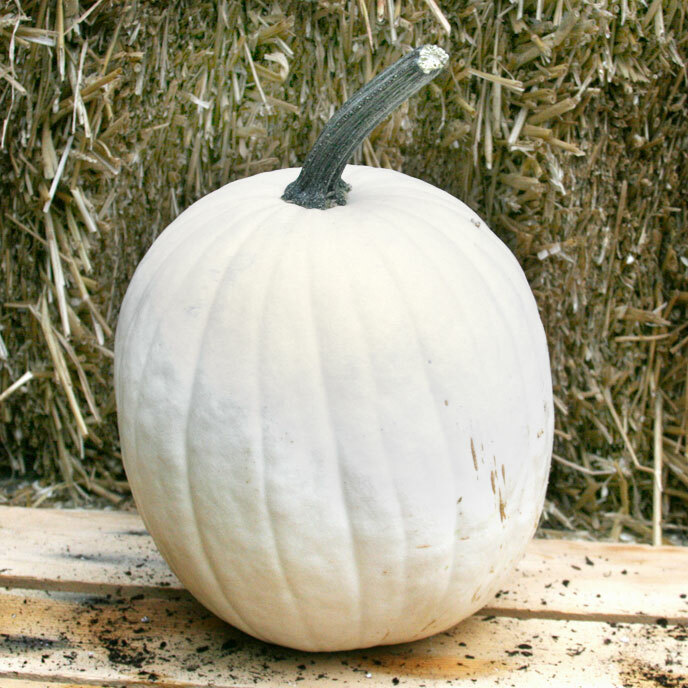 There are other white pumpkins commercially available including a few maxima type (C. maxima) pumpkins like "Casper" which are significantly different in characteristics to Cotton Candy.